Basic VPS Servers is with High-Performance Hosting. Enjoy 50% rebate on Udderly Fantastic Web Hosting with FREE domain name. How long is my discount code valid for? When you sign up for a plan with a coupon code, your discount will be valid for the first term only. Now, how much discount you get in the end depends on the discount percentage and the billing term you select. If you select 2 years, your discount will be applied to the 2 years payment and then after that you will be charged the regular rate for the next term. Will my plan be renewed automatically? Can I cancel my plan? Yes, by default your plan will automatically be renewed unless you specify otherwise. You can find more information regarding this on FatCow.com. You can change the setting to switch off automatic renewal of hosting plan. As for cancelation, you can do that anytime you like. You can call at 1 888 278 9780 any time of the day and speak to a representative to learn how to cancel your plan. On cancelation after the first 30-day period, you may not get a full refund. Will I be charged for the term upfront? Yes, in most cases you will be paying for the first term upfront when you first build your website or transfer it to FatCow. This is why discount codes come in very handy as you can save a decent amount off your entire bill for the term of your choice. For some hosting plans like the Original Fat Cow plan, you can sign up for a monthly payment structure too. However, if you opt for monthly payments the rate will be higher. Also, most codes apply only two yearly plans so you will end up paying more than you could with a yearly payment. Why should I choose FatCow? FatCow is hosting solution provider for individuals, small businesses, and medium-sized enterprises. It was founded in 1998 with the idea of making hosting as simple as possible for end users. Their plans have everything you can find with high-end hosting companies except for the confusing jargon, information overload, and hidden prices. FatCow provides domain registration and hosting for businesses that are just starting out and want to get their online identity ready. If you are looking for an easy to use and easy to control web hosting service, FatCow might just be the perfect fit for you guys. Since their focus is on budding businesses, they provide excellent website builder tools. From basic branding websites to e-stores, you can get your website up in a matter of days. The rates are also kept very reasonable and with coupon codes in your hand, you will get your penny’s worth. At FatCow, you can find your perfect domain especially if you are going for one of those upcoming New TLDs. The domains are very cheap and you can use promo codes to get it at a discount. There are hundreds of possibilities and you can be at ease when you register your new business domain with them. FatCow makes it simple and fast for new businesses to create their website. While other hosting websites have different versions of shared hosting plans, FatCow just offers one plan with everything a new business could ask for. It comes with all the tools, features, and services required by your business and you have them all under one plan for one price. 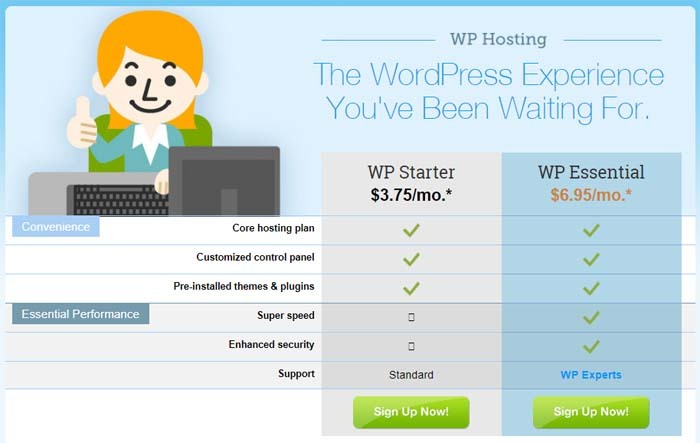 Those customers who want to start a blog should go for the WordPress Hosting. Again, with these plans, there are no hidden charges or unnecessary information. The plans are designed specifically for WordPress websites and allow even better control and management of content. You get curated themes, pre-installed plugins, and a customized control panel. You get all the core features of web hosting as well as additional website security and enhanced performance. They have an SSD-based infrastructure that allows fast speeds. Also, you get expert support regarding WordPress. Both the plans offer the same quality services from FatCow, however, the WP Essential plan has more rigorous security and SSD-based super speed infrastructure. For businesses that outgrow their expectations fairly sooner than expected, FatCow offers Virtual Private Servers. You get more resources, higher speeds, bigger storage etc. at reasonable rates. The VPS hosting plans are deployed instantly and there are no extra usage charges. Your websites needs are covered pretty well and your business gets the right kind of opportunity to grow. The ultimate plan for hosting gets you your own dedicated server. This is best for medium-sized businesses that have outgrown even the resources generally provided within VPS plans. You get the same pre-installed scripts, cPanel features, high-standard security, lighting fast speeds, and free domain. FatCow offers no questions asked money-back guarantee that is valid for the first 30 days. You can choose to cancel the plan and get your money refunded. This is only possible if you paid with a credit/debit card. If you availed the free domain with your hosting plan, you will be charged $15.00 for it.